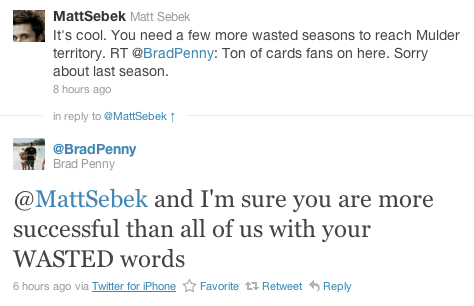 Brad Penny, he of his hot girlfriend, perfectly square head and a handful of games as a Cardinal in 2010, took to Twitter yesterday to say he’s sorry for not being around much this year. He’ll tell you what though! Next time, he’s going to pick us all up one weekend, take us for ice cream, go to a movie, and then the park! Anything you want Cardinal fans, it’ll be your day! No, this time he’s not lying…not like July, August, and September. He’ll be there. Promise! A ton of cards fans on here. Sorry about last season. Injuries are unfortunately part of the game but I enjoyed suiting up to play i’n [sic] front of some of the best baseball fans i’n [sic] America.